A Detroit businessman pledged $100,000 in scholarships to 10 local teens who wrote essays about what each would do to improve the image of African-American males. The money never came. Now a group of black Seattle-area professionals is coming together to restore faith. Anthony Shoecraft and Chinua Lambie don’t care that the promise came from an organization 2,300 miles away. Both trust Seattle’s black community to honor it. Two years ago, Detroit businessman Sid E. Taylor and his Real Life 101 Scholarship Fund pledged $100,000 to help 10 former students of South Shore PK-8 pay for college. Taylor says he was drawn to help the teens after seeing a Seattle Times article on a National African American Parent Involvement Day (NAAPID) event organized by Shoecraft. On that day, more than 250 black men dressed to the nines greeted arriving students with high-fives. After Taylor’s nonprofit got in touch, 10 grateful young men — selected for the Real Life scholarships on the strength of 1,000-word essays about what each would do to improve the image of African-American males — waited for word. So did their parents. It never came. Neither did the money. As a result, some of the students unenrolled in school and shifted to a less expensive choice. “We’ve had this promise that was broken. It’s black folks who are attempting to restore it,” says Shoecraft, who with Lambie and about a dozen other black professionals recently formed their own nonprofit, MoHundred, to raise money and make the children whole. “What [Real Life 101] did is not the norm. We are the norm,” says Lambie, a South Seattle native and investment professional. Named by a community elder in reference to the NAAPID event that turned out a hundred more community members than expected, MoHundred, whose steering committee meets weekly, has partnered with the College Success Foundation to raise the promised $100,000 and administer scholarships to the 10 students. Lambie says the money should have come from the community all along. “We’re in one of the richest cities in the world, with three of the world’s richest people, and we can’t find $100,000 for our black youth right in our backyard?” he asks. MoHundred hopes to pool funds from the local black community and allies. So far, nearly $5,000 has been pledged, according to Shoecraft and Lambie. Real Life occasionally hosted elaborate banquets for scholarship awardees attended by people such as professor and political commentator Michael Eric Dyson, and businessman Steadman Graham, and claims to have provided more than 500 scholarships throughout its history. Impressed by the outpouring of support for local youth at the NAAPID event in 2016, Real Life wished to establish roots in Washington state, then-Executive Director Bryant George told The Seattle Medium. Shoecraft, who admired the organization’s track record, became the point person between the organization and black male students interested in applying for the scholarship Real Life would administer in $2,000 chunks over five years. 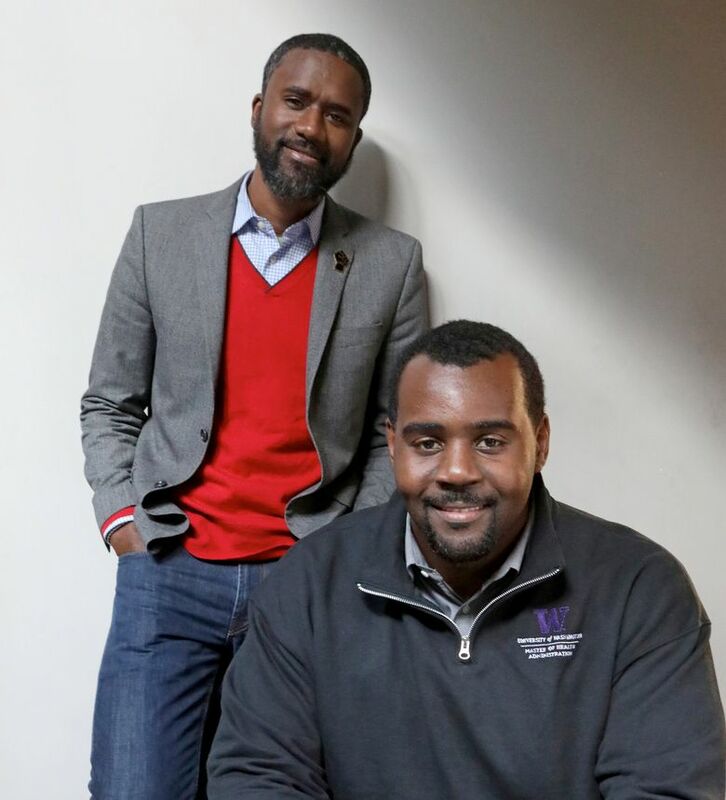 Word of the opportunity soon spread in the family networks of Seattle Public Schools’ more than 4,200 black male students. Principals and teachers at high schools including Garfield, Rainier Beach and O’Dea were encouraged to prod students to apply. Shedrick Johnson was one of the 10 students awarded a Real Life 101 scholarship in May 2016. That month he attended a ceremony at South Shore, where he joined his fellow dapperly attired awardees on stage. Family and friends beamed as each teen received a fully loaded laptop, congratulations via video from Taylor and, most of all, the promise of a $10,000 scholarship. Headed to Wiley College in Texas, the Garfield High grad saw the money as a godsend. “It was going to be a significant amount to help me attend college. It was a scholarship that I depended on … I thought the money was secured,” says Johnson, who is now in his sophomore year. When the money never materialized. Johnson’s parents were forced to take out a PLUS loan to keep him enrolled. Some of the other young men have had to take out additional loans, exchange plans for four-year universities in favor of two-year community colleges, and one had to drop out of South Seattle College to further save for tuition. While the students scrambled, Real Life 101 Scholarship Fund founder Sid Taylor says he has been unfairly demonized during the ordeal. “Only thing I could’ve done differently is never offer those scholarships,” Taylor said by phone from his Detroit home. The 69-year-old former Marine says the families knew all along the money was conditional on Real Life 101’s ability to raise funds. It was in the fine print of the acceptance letter. “$2,000 a year isn’t going to be a lot if you don’t use it properly. It was always meant to provide supplemental funding,” says Taylor, adding that he should be judged on his organization’s total history, not one event. Taylor says a company reneged on a pledge, which made him unable to fulfill his own. He declined to name the company but says he’s “working tirelessly” to still locate funds. The Vietnam veteran says the experience has led him to consider shutting down Real Life 101. Lisa Phillips, principal of Cass Technical High School in Detroit, credits Real Life 101 with sending hundreds of students to college who otherwise would not have attended. Real Life has partnered with Cass Tech the past six years. “Sid is the kind of person who really cares about our kids. He’s there when a parent dies or for a graduation,” says Phillips, who was Michigan’s 2017 Principal of the Year. Nichelle Alderson, parent of a Seattle scholarship winner, shares a starkly different experience, saying the families have not heard directly from Taylor in almost two years. “It’s really infuriating to hear him say that the money was conditional. We were counting on it. There was no expectation that it was not going to happen.” says Alderson, whose son JoNathan attends Big Bend Community College in Moses Lake. Alderson, a University of Washington graduate who became a single mother after the death of her husband in 2004, says at no time did Real Life 101 say the money was dependent on the group’s ability to raise funds. During her son’s first few months at Big Bend in the winter of 2017, Alderson and other parents got a letter from Real Life 101 asking them to donate and to solicit friends and family. Taylor says that in the near future, he plans to reach out and donate to MoHundred. For him, MoHundred’s mission goes beyond keeping a financial promise, into restoring faith in the local black community. Many of the Real Life awardees’ parents have had to move on, of course, even though, as in Tia Isabell’s case, they carry an additional financial burden. Recently, Isabell says, she came across her son Aristotle’s 2-year-old essay with its detailed plans on improving the image of black males. His idea? A local black-led organization devoted to empowering its own community.